CARLTON'S frustration at losing Jarrad Waite to North Melbourne via free agency will almost certainly be exacerbated by the news the Blues will not be compensated for the loss of the key forward. North signed Waite in the opening hour of the NAB AFL Free Agency Period on Friday. Given Waite was an unrestricted free agent, the Blues were unable to keep him by matching North's offer. And on Friday afternoon, the AFL announced that the Blues would be left empty handed under the free agency compensation model. "Based on the player's age (31) and the contract offer, the AFL advised the Carlton FC there would be no compensation for the loss of player Waite," the AFL said in a written statement. The Roos also secured Shaun Higgins on Friday afternoon after tabling an offer for the restricted free agent that morning. The Bulldogs had 72 hours to decide whether to keep Higgins by matching that offer. But the AFL announced on Friday afternoon that the club had decided not to do so and would be compensated with a second-round draft pick. Waite informed Carlton on Monday morning that he was leaving the club to exercise his free agency rights, but did not specify which club he would be joining. AFL.com.au reported on Monday that it understood Waite would join North, who had been courting the Blues spearhead since meeting with him in July. 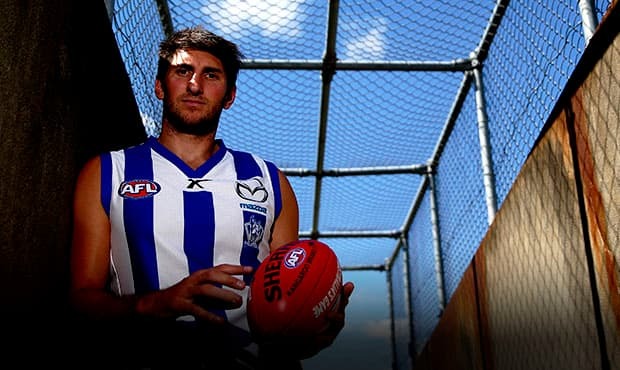 Waite is the second big-name free agent signed by the Kangaroos in the past 12 months, after former Saint Nick Dal Santo joined the club in last year's free agency period. A strong contested mark, Waite will give North another tall target in attack, with competition for places in the Roos' forward line set to be a lot tougher. Given Drew Petrie remains a lock at full-forward for North and Ben Brown looks set to cement himself as a senior player in 2015, Waite's arrival at North will put the pressure on Aaron Black to overcome the injury and form problems that limited his output this season. Robbie Tarrant and Mason Wood will also be firmly in the mix for spots in the Roos' attack next season. Given Waite is an unrestricted free agent, the Blues could not keep him by matching a rival offer. Waite kicked 252 goals in 184 games for the Blues and finished third in Carlton's 2007 best and fairest award. The 31-year-old is the son of two-time Carlton premiership player Vin Waite and joined the Blues as a father-son selection in the 2001 national draft at pick No.46. Carlton football manager Andrew McKay said it would be sad to see Waite leave Visy Park after 13 seasons.